See also the BSA Model Nos. 2 and 3 or bolt-actioned Lee-Enfield training rifles Long-Lee, RF Short Mks I & II, and Rifles Nos.1 to 9, War Office Miniature, etc. A late model example is shown below, with the folding B.S.A. No.8 aperture rear-sight ( lowered) and the No.19 tunnel fore-sight with the "L" formed dual tip-over element system permitting use of either a blade or a ring fore-sight. The later design of bolt and locking system is thus here illustrated. ( see further notes below). 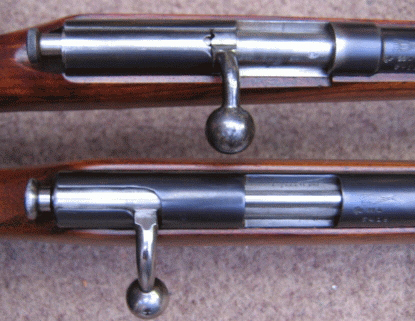 The barrel and action are a one-piece unit. Introduced in 1908, the Model No.1 rifle was a target rifle in the minimal sense. 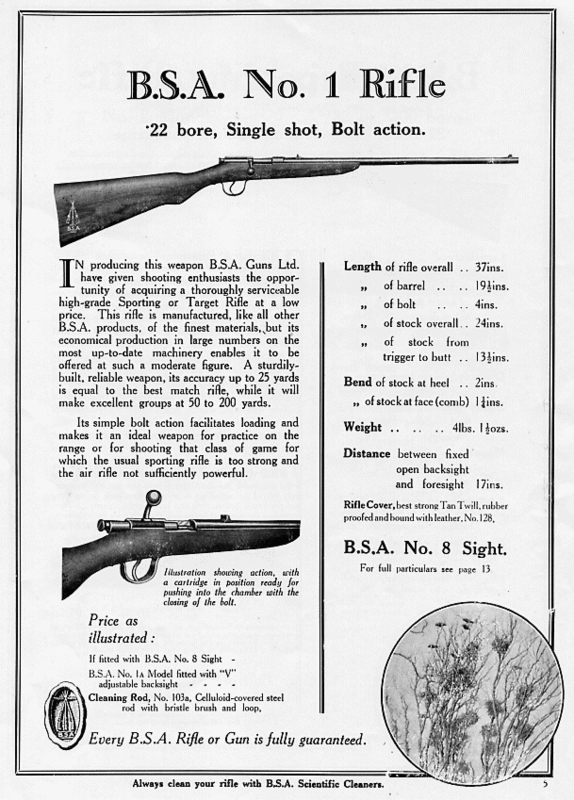 It, and its bolt action successors to the BSA range of .22 rimfire rifles, could quite reasonably have been considered to be more of a sporting nature in appearance - indeed, in later years that is more or less where it, and the following Model No.2, eventually fell in the marketing scheme of things once they were superseded by the more accurate Martini actioned rifles. Nonetheless, at a time when there was a growing market for economically priced small-bore rifles, the Model No.1 was both intended, and destined, to fall into the category of a training and target rifle. 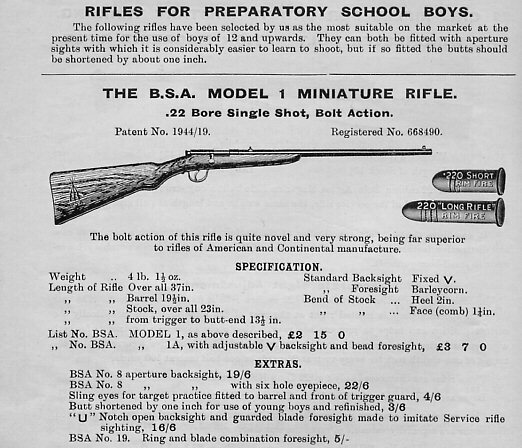 Indeed, it was advertised specifically as being suitable for use by twelve-year-olds, particularly for school or cadet use.
. A contemporary of these rifles, The Vickers Armstrong Martini Mark II rifle, which company had already earned a fine reputation for the accuracy of their barrels, cost an astonishing £5:0s:0d. Interestingly, only one year later, by 1910, the BSA Model No. 2 had been introduced only a short while. At this point, BSA manage to market the No.2 at only £1:10s:0d ( £1.50 ) whilst the W.O.P. rifle was still selling for around £2:5s:0d ( £2.25 ) in its most basic form. The Model 1 was still being advertised in 1919 ( advertisement below), through the 1920s, and still immediately pre-World War II as a .22RF rifle and a smooth-bore No.1 shot or BB capable garden gun. 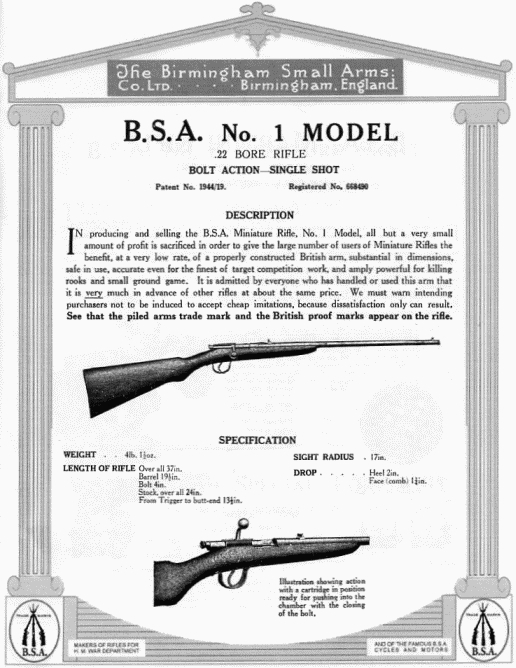 Both the Model No.1 and its follow-on equivalent of the Model No.2 were still on offer in the mid 1950s in slightly modified form (the bolt and bolt-handle arrangement was altered so that only the handle and its boss rotated on locking, rather than the whole bolt body) as the BSA "Sportsman" single-shot rifle. That rifle was then also marketed with a five-round box magazine as the "Sportsman Five" and, with a tubular magazine, as the "Sportsman Ten & Fifteen" models. By then, there was competiton in the area of economically priced single-shot .22RF target and sporting rifles, from a number of German manufacturers such as J.G.A, Geco, Paatz and indeed Mauser, although their rifles were priced nearer to the cost of the American repeating .22RF rifles, close on £20.00 rather than the £5 to£10 asked for the other manufacturers' single-shot examples. Alongside left is a comparison image of the early bolt, with the War Office Pattern type B.S.A. 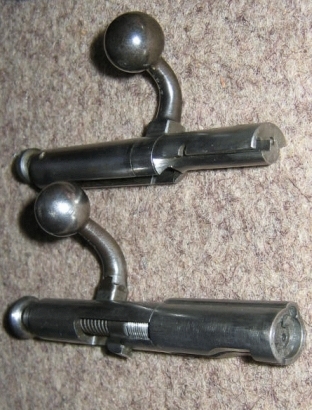 designed and patented bolt-head with (bottom) the hooded extractor, and (top) the later bolt, only the handle and boss of which rotates to lock the action. The two actions can be seen below viewed from above. Below, barrel markings are very similar to those of the War Office Pattern Miniature rifle and, there still, are the familiar "Piled Arms", the motif of the Birmingham Small Arms Company. The photograph below of a cased Model No., 1 in DeLuxe form, has a most interesting history. This BSA Model 1 target rifle, an example built by Alexander Martin of Glasow, is in its fitted case with all its accessories, including jags, brushes, cleaning rod and a small tin of bore-cleaning paste. It has a fold-down ring foresight, and a BSA No.8 fold-down rear sight. The gun was bought in 1909 for a 15-year-old boy who was to lose his life on the Somme barely a decade later. The rifle was passed to the present owner through the family.